Cedar Meadows Resort and Spa organized the perfect two days to give me a taste of the vacation destination in Timmins during the summer. I first visited the resort and spa during the dead of northern Ontario’s harsh winter when I dined, dipped in the Nordic baths (which was much needed during the freezing temperatures), and snuggled under a blanket on the winter wonderland wildlife tour. This time, I got to visit Cedar Meadows Resort and Spa with my boyfriend during the sunny and warm bird chirping season. I’m lucky to have had the opportunity to visit Cedar Meadows Resort and Spa during both seasons; Cedar Meadows is as charming and welcoming in the summer as it is in the winter. Stay tuned for more on my visit at Cedar Meadows Resort and Spa! Although Cedar Meadows is only minutes from down town Timmins, it feels like miles from civilization. We were able to go into town to get Italian take-out and drive back out to our getaway. While looking out on the back deck of our chalet we were able to see a river lined by Ever Greens and white swans swimming by. This is nature at its best without us having to battle mosquitoes all day long. Cedar Meadows Resort and Spa’s identical self contained chalets (they have 5 of them) feel like home; they have all the amenities of home, yet it is still exciting to stay there because of their cottage ambience. Oh how I dream of owning a cottage someday (on a beach of course). If only my dream cottage could look anything like Cedar Meadows bright chalets. They are the perfect size with everything I would ever want including a wrap around balcony, cathedral ceilings, stained glass windows, a loft bedroom, and wood beam accents (among other luxuries). Staying at Cedar Meadows Resort and Spa had me dreaming a new dream. 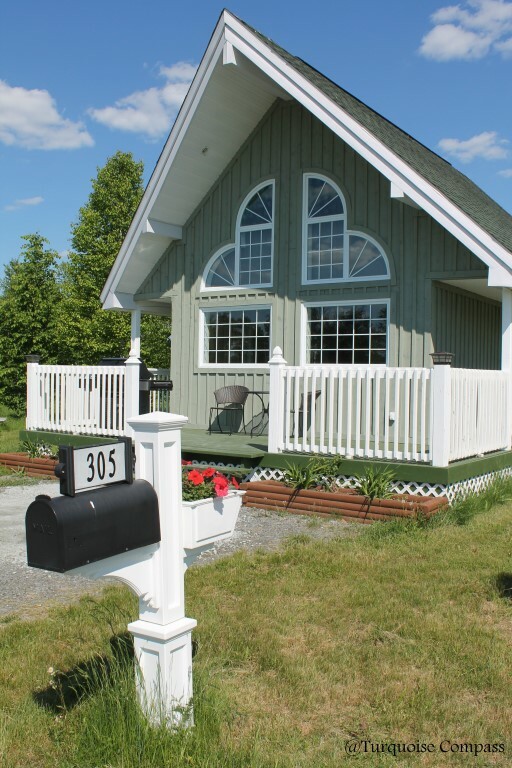 This entry was posted in Canada, Ontario, Reviews, travel and tagged Cedar Meadows, Cedar Meadows Resort and Spa, Chalet, experiences, Northern Canada, Northern Ontario, Ontario, Spa, Summer, Timmins, Travel, travel photography, Turquoise Compass, Wildlife Tour by Turquoise Compass. Bookmark the permalink. The chalet looks so cute! Just like a storybook cottage! Thanks so much! It does doesn’t it? Well, i dont think i’ve seen better cottages. Those are beautiful! They are so cute, and as said in the comments, almost story-like.